Scientists have known for years that together, bacteria and plants can remediate contaminated sites. Ramakrishna Wusirika, of Michigan Technological University, has determined that how you add bacteria to the mix can make a big difference. He has also shed light on the biochemical pathways that allow plants and bacteria to clean up some of the worst soils on the planet while increasing their fertility. Wusirika, an associate professor of biological sciences, first collected stamp sands near the village of Gay, in Michigan's Upper Peninsula. For decades, copper mining companies crushed copper ore and dumped the remnants—an estimated 500 million tons of stamp sand—throughout the region. Almost nothing grows on these manmade deserts, which are laced with high concentrations of copper, arsenic and other plant-unfriendly chemicals. 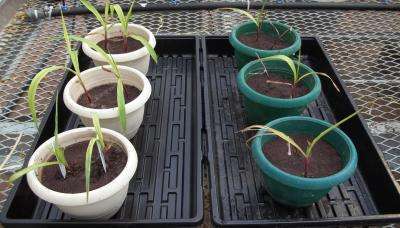 the conventional method, immersing the roots of maize seedlings in bacteria and planting them in stamp sand. After 45 days, the team uprooted the plants and measured their dry weight. All maize grown with bacteria was significantly more vigorous—from two to five times larger—than the maize grown in stamp sand alone. The biggest were those planted as seedlings or as germinated seeds. However, when the researchers analyzed the dried maize, they made a surprising discovery: the seed-planted maize took up far more copper as a percentage of dry weight. In other words, the smaller plants pulled more copper, ounce per ounce, out of the stamp sands than the bigger ones. That has implications for land managers trying to remediate contaminated sites, or even for farmers working with marginal soils, Wusirika said. The usual technique—applying bacteria to seedlings' roots before transplanting—works fine in the lab but would be impractical for large-scale projects. This could open the door to simple, practical remediation of copper-contaminated soils. But the mere fact that all the plants grown with bacteria did so well also piqued his curiosity. "When we saw this, we wondered what the bacteria were doing to the soil," Wusirika said. "Based on our research, it looks like they are improving enzyme activity and increasing soil fertility," in part by freeing up phosphorus that had been locked in the rock. The bacteria are also changing copper into a form that the plants can take up. "With bacteria, the exchangeable copper is increased three times," he said. "There's still a lot of copper that's not available, but it is moving in the right direction." By analyzing metabolic compounds, the team was able to show that the bacteria enhance photosynthesis and help the plants make growth hormones. Bacteria also appear to affect the amount phenolics produced by the maize. Phenolics are antioxidants similar to those in grapes and red wine. Compared to plants grown in normal soil without bacteria, plants grown in stamp sand alone showed a five-fold increase in phenolics. However, phenolics in plants grown in stamp sand with bacteria showed a lesser increase. "Growing in stamp sand is very stressful for plants, and they respond by increasing their antioxidant production," Wusirika said. "Adding the metal-resistant bacteria enables the plants to cope with stress better, resulting in reduced levels of phenolics." "There's still a lot to understand here," he added. "We'd like to do a study on stamp sands in the field, and we'd also like to work with plants besides maize. We think this work has applications in organic agriculture as well as remediation." I'm always marveled at what our Scientists & Technologists can do when society focuses on fixing problems. Too many mis-educated critics simply want to tear down any wall of progress for rectifying past mistakes because they fantasize living in a primal environment as nomads & cavemen is the ultimate road to progress. Mankind has made mistakes, but with the invention of the micro-scope just look at the things we've discovered about bacteria & using this technology to fix the messes we make. In the past nomads would just move on to different hunting grounds & cavemen would find different caves after overhunting or denuding a forested area for firewood. Nowadays we can't do these things, but voila, we are learning through science that we can avoid being haphazardly destructive to our environment. My hat is off to my fellow practitioners in scientific endeavors in refusing to participate in the "blame game", and instead they roll up their sleeves & go to work fixing these problems. Some pretty amateur mistakes are visible right in the photo. Somehow bacteria are not capable of transferring between pots that are right next to each other... yeah, right. But even more importantly, the experimenters decided to use different pot colors for the two groups. I guess it's the lazy way of labeling them, but it causes important differences. First, the outsides of the green pots will absorb more sunlight than the white pots, heating the soil up two a higher temperature and driving off moisture. If they didn't compensate for the excess water loss extra water, then the plants in the green pots might have had to close down their stomata more often to prevent water loss, leading to less intake of CO2 and less growth. If they did compensate with extra water that wasn't distilled, more salts would have built up in the green pot soil, which also would have inhibited the plants from pulling moisture from the soil and caused some other biochemical differences. Also the white pots would have bounced a better spectrum of light at their plants, whereas the green pots would have reflected the least useful part of the spectrum directly at their plants, once again leading to higher temperatures, water loss, and stomatal closure. Instead of changing one variable at a time, they've changed several. There's also going to be differences in how the bacteria respond to the different heat and moisture environments. This is bad science, and I hope for their sake the plants in the photo were not incorporated into the experimental results.